Photo courtesy of PanAmerican seed. 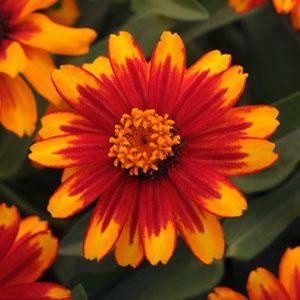 An award winning trial for us last summer, this one features large-petaled single flowers that are orange with a red inner marking on each petal to produce a starburst effect. The star is more prominent in the sun and as the season goes on. As with all the Zaharas, they are well branched, disease resistant and long blooming.